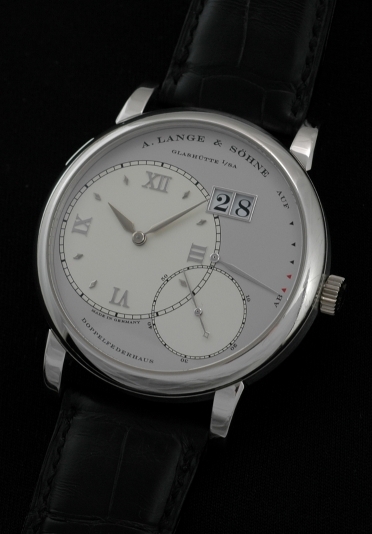 This is 1995 A. Lange & Sohne “Grand Lange” in solid platinum, heavy and large 41.9mm. case. This watch embodies all the finest qualities of Swiss watchmaking. The entire watch is handcrafted and finished right down to the smallest detail. Those seeking this watch will know all about its’ prestige and importance. We are including the original boxes, guarantee and booklet. This Grand Lange was only gently used and is without dings, major scrapes or major creasing in the original band. Of course, the platinum (original) buckle is included. Most importantly, our price could very well be the best in the world at only $31,900!